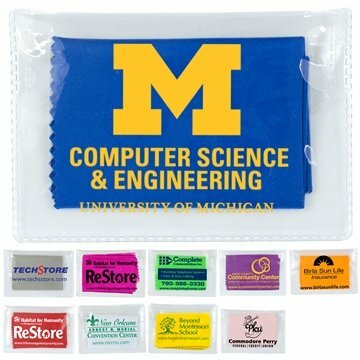 These 100% microfiber cleaning cloths are made with high-density microfiber materials designed to remove dirt, dust, and oily smudges from sensitive surfaces like sunglass, eyeglass and camera lenses, cell phone, as well as laptops,computer screens, and any soft electronic surfaces without scratching. They are one of the most useful promotional products in our digital era. They come with serrated edges. Imprinted pouch with blank microfiber folded and inserted in pouch. Disclaimer: Note: Microfiber cloths are folded by hand and cannot be inserted into pouch uniformly or perfectly aligned. Appreciate the superb service~~ We love the quality of the product and how GREAT our logo looke on it! Nothing to complain about. The product is really nice. the help from your design group and how quick the order came in. The size and the printing of the logo were very nice.